Yep, and I saw a Lion being driven down JBR the other night. Robajob is the lion wearing a seatbelt? do you need a license to keep a dangerous animal or its perfectly fine? and what about endangered spieces? I've heard someone out here has two white siberian tigers which are rare animals now? i guess illegal animal trade is still illegal here? how do they get away with it? ok that is a naive question I know! of course the first thing I would think of when strapping a potentially lethal wild animal into the back of my Beemer is make sure it's wearing a seatbelt. I hope when it grows up it chews the owner's balls off. my local next door neighbour used to have a cheetah, from a pup right up to it was an adult and then he got rid of it...don't know where or how but i can tell you this...that cheetah was more well behaved than some of these idiots who have dogs. I suppose it puts a spin on the phrase "pu ssy patrolling"
great - bet that animal is so well adjusted now. 14k will get you a 5month old thats house trained if your interested!!!!! A wild animal in a car? hope the bite these xxxxxxx the head up! No, it won't. They are all drugged out. It will probably bite the head off the Asian caretaker once it is sober again. But hey, they can be replaced easily. yeah its sad actually. As far as i know animal cruelty is a big no go on the Islam but these motherxxxxxxx...... ah better i dont write it it makes me really angry!!! 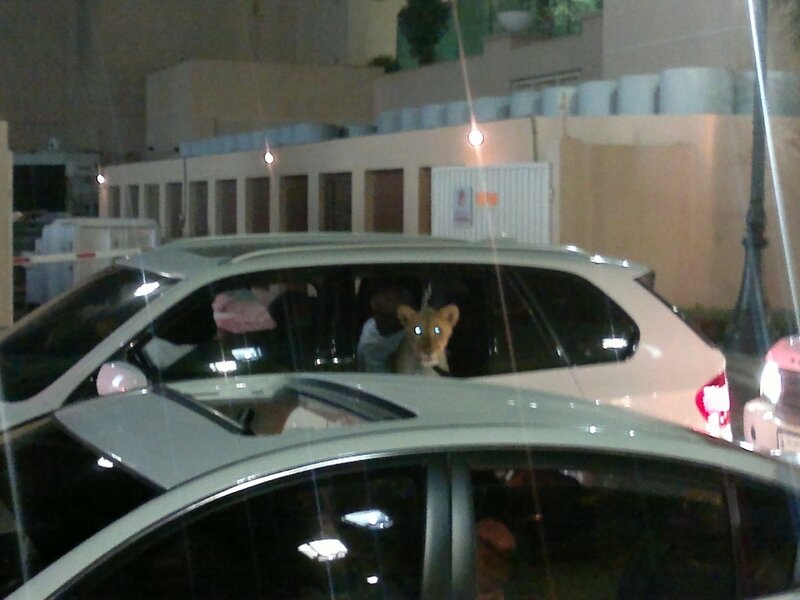 I was driving my kids to school in Dubai a few years ago and the car in front of us had what we thought was a huge stuffed tiger in the back......until it moved its head and looked at us. The car dropped it kids at the same school. A villa near us had a cheetah that they would walk every few nights. My son went shooting at one of the local palaces and came back with tales of all the animals in the private zoo, crocs, cheetahs, meerkats etc. It's crazy. Your son went shooting at the local palace? What do they shoot there?